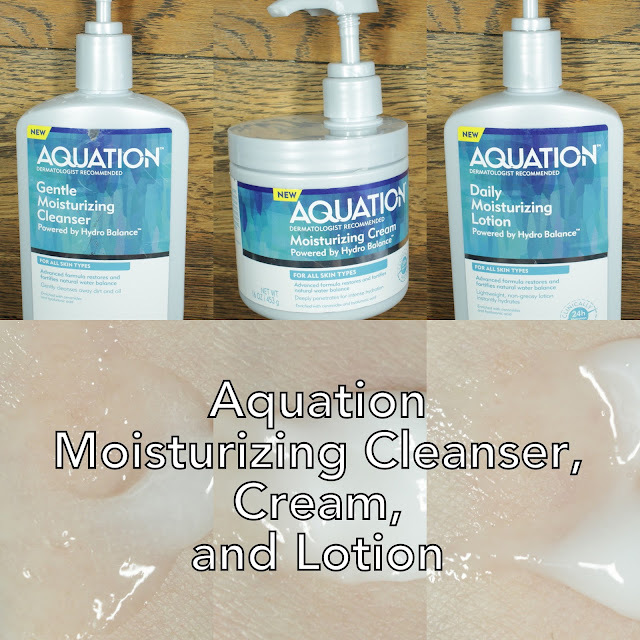 I have been testing three products from Aquation, the Daily Moisturizing Lotion, Gentle Moisturizing Cleanser, and Moisturizing Cream. These are extremely gentle staples of any skin care regimen. Let's have a closer look at the products! The Aquation products I tried have no added fragrance and employ three key ingredients for hydration: ceramides, hyaluronic acid, and marine algae extract. Ceramides are lipids that are naturally found in our skin and are a barrier to keep in moisture. Hyaluronic acid (sodium hyaluronate) is a humectant that pulls in moisture from the air - it is also a natural component of a healthy skin barrier. Marine algae (laminara digitata extract) in the brand's formulation is encapsulated and provides a longer release of moisture. There are endless elements that affect your skin daily – not all of them in your control. There is a solution. Skincare that protects, restores and fortifies, with moisture you can feel. Clinically proven results you can see. Moisture balance technology you can count on. The perfect Aquation for hydrated + healthy skin. Powered by Hydro Balance™ our advanced dual phase technology delivers hydration and creates an invisible barrier to help prevent moisture loss while encapsulated actives penetrate deeply for long-lasting hydration. 100% of women in clinical trials saw more hydrated skin, even up to 24 hours. 93% experienced instant hydration. 93% found non-irritating. The Aquation Daily Moisturizing Lotion is a nicely hydrating fragrance-free formulation that I wore on both my face and body. I never experienced any dryness or irritation and was completely acne-free on my face while using it. The ingredients are ones that are extremely compatible with my skin, and this light lotion absorbed quickly. 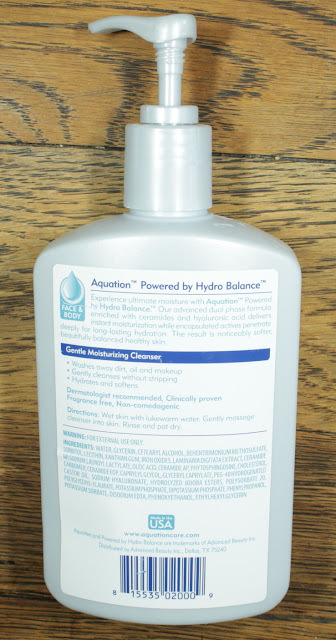 The Aquation Gentle Moisturizing Cleanser is creamy with minimal lather. It can be used on the face or full body. Gently cleanse away dirt, oil and makeup while infusing moisture—revealing fresh, soft skin. Our formula won’t over dry or strip your skin and is enriched with ceramides and hyaluronic acid to help maintain the skin barrier. For use on face and body. This cleanser was a bit too moisturizing for me to use in summer because I need something that strips off sunscreen and makeup from my face. However, it was absolutely perfect for my hands, which I wash frequently. It definitely cut down on my need for cuticle oil and lotion with daily use. It would be also be great for someone with extremely dry skin to use in the shower. The Aquation Moisturizing Cream is a slightly thicker formulation than the Daily Moisturizing Lotion, but it also absorbs quickly and it may come down to personal preference in texture between the two products. I also tested this both as a body and face moisturizer and experienced no irritation or acne whatsoever and my skin stayed nice and soft. Each of these products, the Daily Moisturizing Lotion, the Gentle Moisturizing Cleanser, and the Moisturizing Cream are available at Walmart for only $8.96 for 16 oz. They are all free from added fragrance and employ very gentle ingredients like glycerin, hyaluronic acid, and ceramides. These products are perfect for use by the whole family since they are a great deal and are unlikely to cause any reactions even with sensitive skin types. They worked for me on both face and body, though the Gentle Moisturizing Cleanser was a bit too rich for me for summer use on my face, but perfect on my hands. I could easily see any of these products also working great for shaving for both men and women - if you are prone to dry skin, using lotion instead of shaving cream is perfect!